Adrian Moreno Wins Event 74! 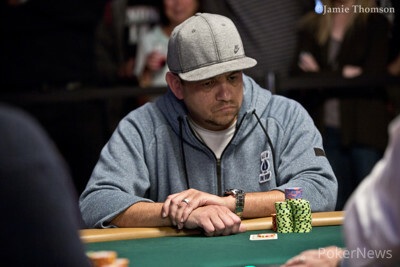 Adrian Moreno won his first WSOP gold bracelet and $528,316 in Event #74: $1,111 The Little One for One Drop. Moreno came from behind to beat Martin Lesjoe heads-up and claim the bracelet and the top prize of $528,316. On the final hand, Moreno got Lesjoe all in on the flop with the nut flush draw against a pair and hit the flush on the turn. He danced around and celebrated with his friends before sitting down in a chair alone and crying for a moment. Moreno recently lost one of his best friends, and much of his emotional reaction to winning was tied to the loss of his friend. "It was pretty rough for me," Moreno said. "I lost one of my best friends and flew home for the funeral. Then I flew right back to play the tournament. I dedicated my whole day, my whole tournament to him." Moreno came into today 11th of 12 remaining players. Matt Berkey was holding a huge lead coming into the day with almost a third of the total chips in play, but Moreno managed to move up the ranks and eventually claim his first WSOP bracelet. "I decided to play it like a sit-and-go. Just let people get out and move up. Then pick my spots." The final table action was quick at the start. On Hand #16, Alexandros Papadopoulos got all in against Lesjoe with queen-high against pocket sixes. Papadopoulos couldn't connect with the board and was eliminated in ninth place. Samuel Vonkennel was next to go in eighth place. He got all in on a nine-high flop with pocket eights against Berkey. Berkey had tens and held to send Vonkennel to the rail. Ricardo Ramos was eliminated in seventh place by the eventual sixth-place finisher, Giuseppe Pantaleo. Pantaleo had aces and made a full house to knock out Ramos. Then, Pantaleo was eliminated by Lesjoe, who had about half the chips with five players remaining after he rivered an ace against Pantaleo to beat his pocket queens. Richard Dixon was knocked out in fifth place by Moreno. Dixon lost a big pot one hand before busting to Moreno. Moreno made two pair and managed to dodge a ton of outs to win the hand and earn a full double. The next hand, Moreno finished Dixon off. Dixon raised all in, and Moreno and Jimmy Guerrero called from the blinds. They both checked it down, and Moreno made a straight to finish Dixon off. Then, Berkey went on a big upswing and knocked out Guerrero in fourth place. Berkey flopped top pair and faded Guerrero's flush draw to send him home in third place. Berkey followed him out 14 hands later. He doubled Moreno and then got all in with top pair against Lesjoe's flush draw, and Lesjoe hit the flush on the turn. That left Lesjoe and Moreno close to even going into heads-up play. Lesjoe gained the lead quickly, and Moreno need to double up. He did did, eventually going on to win. "He's a good player," Moreno said. "I decided I needed to change my play up and be more aggressive. It worked out." 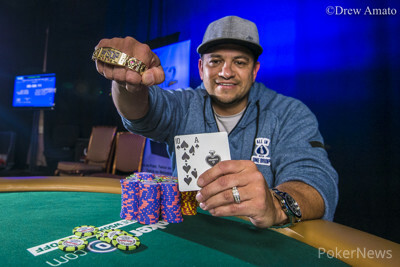 Moreno capped off a strong summer with his first bracelet. His first outing was a win in a $235 Daily Deepstack. He then finished 23rd in the Monster Stack and 19th in the Crazy Eights tournament later in the series. After busting Day 2 of the Main Event, Moreno flew home for his friend's funeral before registering for the Little One for One Drop on Thursday. The tournament's first day was rough, given the circumstance, but Moreno pulled through to claim his first WSOP gold bracelet and more than a half million dollars in prize money. "You always dream of winning a bracelet every time you play a tournament," Moreno said. Adrian Moreno Wins The Little One for One Drop! Hand #196: Martin Lesjoe limped, and Adrian Moreno raised to 1,100,000. Lesjoe called. The flop came , and Moreno checked. Lestjoe bet 1,200,000, and Moreno went all in. Lestjoe called with a pair, showing , and Moreno was on a draw with . The turn was the , and the river was the , giving Moreno the flush and the win. Moreno jumped around, waving his hands in the air as his friends on the rail erupted. 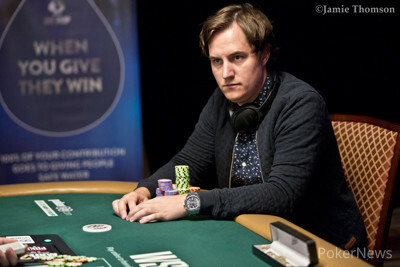 He then sat down for a moment and had a bit of a cry, having just won his first WSOP gold bracelet. Hand #193: Adrian Moreno raised to 1,100,000, and Martin Lesjoe called. The flop came , and Lesjoe checked. Moreno bet 1,500,000, and Lesjoe called. The turn was the , and Lesjoe checked. Moreno went all in, putting Lesjoe at risk should he call off his last 11,300,000. He folded. Hand #194: Lesjoe raised to 1,100,000, and Moreno folded. Hand #195: Moreno raised to 1,100,000, and Lesjoe folded. Hand #188: Martin Lesjoe limped in, and Adrian Moreno checked his option. The flop saw Moreno check-call a bet of 550,000 from Lesjoe. Both players checked the turn, and the same action occurred the river. Moreno looked upset when Lesjoe checked back the river, and it made sense, as Moreno tabled for a rivered flush to take the pot. Hand #189: Moreno raised to 1.1 million preflop, and Lesjoe called to see the flop. Lesjoe check called a bet of 1.4 million, and they both checked the turn. The on the river saw two more checks, and Moreno showed for the winning hand. Hand #190: Lesjoe raised to 1.25 million, and Moreno called. The flop came down , and both players checked. The hit the turn, and Moreno check-called a bet of 1.3 million. The completed the board, and this time, Moreno check-folded when Lesjoe bet 2.625 million. Hand #191: Moreno raised to 1.1 million, and Lesjoe released his hand. Hand #192: Moreno received a walk. Hand #181: Adrian Moreno raised to 1,100,000, and Martin Lesjoe called. The flop came , and both players checked. The turn was the , and Lesjoe checked. Moreno bet 1,300,000, and Lesjoe called. The river was the , and Lesjoe check-folded to a bet of 1,650,000 from Moreno. Hand #182: Moreno got a walk. Hand #183: Moreno raised to 1,100,000, and Lesjoe called. The flop was , and both players checked. The turn was the , and Lesjoe bet 1,500,000. Moreno folded. Hand #184: Moreno got a walk. Hand #185: Moreno raised to 1,100,000, and Lesjoe folded. Hand #186: Lesjoe raised to 1,250,000, and Moreno called. The flop came , and both players checked. The turn was the , and Moreno bet 2,000,000. Lesjoe called. The river was the , and Moreno bet 3,200,000. Lesjoe called. Moreno won the pot with for a flush. Hand #187: Moreno raised to 1,100,000, and Lesjoe called. The flop came , and both players checked. The turn was the , and Lesjoe bet 1,200,000. Moreno called. The river was the , and Lesjoe bet 3,600,000. Moreno folded. Hand #171: Martin Lesjoe received a walk in the big blind. Hand #172: The favor was returned, as Adrian Moreno received a walk. Hand #173: Moreno moved all in and took down the pot. Hand #174: Lesjoe raised to 1.25 million, and he took it down. Hand #175: Moreno moved all in, and Lesjoe folded. Hand #176: Lesjoe limped in, then folded when Moreno made it 2.5 million to go. Hand #177: Lesjoe received a walk. Hand #178: Lesjoe raised to 1.25 million and took down the pot. 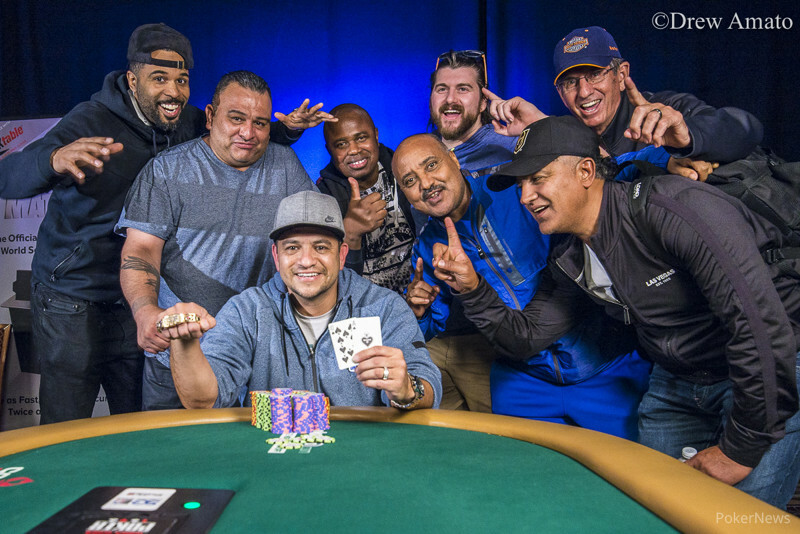 Hand #179: Moreno raised to 1.1 million, and he took it down. Hand #180: Lesjoe raised to 1.25 million, and Moreno moved all in for 10.7 million. Lesjoe snap-called, and they were off to the races. The race was all but over after the flop gave Moreno a set, coming . Lesjoe needed running cards to chop or win, but the on the turn sealed it. The chips were counted down, and the two players are virtually even after that pot. Hand #160: Martin Lesjoe folded, and Adrian Moreno got a walk. Hand #161: Moreno raised to 1,025,000, and Lesjoe called. The flop came , and both players checked. The turn was the , and Lesjoe bet 1,500,000. Moreno called. The river was the , and Lesjoe bet 5,000,000. Moreno folded. Hand #162: Lesjoe limped, and Moreno raised to 2,000,000 total. Lesjoe folded. Hand #163: Moreno raised to 1,050,000, and Lesjoe folded. Hand #164: Lesjoe raised to 1,250,000, and Moreno went all in. Lesjoe folded. Hand #165: Moreno raised to 1,050,000, and Lesjoe called. The flop came , and both players checked. They both checked the turn and the river, and Lesjoe won the hand with . Hand #166: Lesjoe raised to 1,250,000, and Moreno shoved all in. Lesjoe folded. Hand #167: Moreno raised all in, and Lesjoe folded. Hand #168: Lesjoe raised to 1,250,000, and Moreno called. The flop came , and Moreno checked. Lesjoe bet 1,300,000, and Moreno called. The turn was the , and Moreno checked. Lesjoe bet 4,025,000, and Moreno folded. Hand #169: Lesjoe got a walk. Hand #170: Lesjoe raised to 1,250,000, and Moreno went all in. Lesjoe folded. Hand #157: Adrian Moreno limped in, and Martin Lesjoe checked his option. Both players checked the flop, and Lesjoe checked again on the turn. Moreno fired 1.2 million, and that was good enough to take the pot. Hand #158: Lesjoe raised to 1.1 million preflop, and Moreno called to see the flop. Both players checked that flop, and the hit the turn. Moreno bet 1.225 million, and he won the pot. Hand #159: Moreno made it 1.05 million to go preflop, and Lesjoe called. The flop came , and both players checked. The came on the turn, and Lesjoe checked again. Moreno bet 1.225 million again, but this time, Lesjoe raised to 4.8 million. Moreno thought for a bit before folding, and Lesjoe took the pot.